Exceptional student research and achievement in the humanities and social sciences will be showcased Saturday, May 18 during Lawrence University’s 16th annual Richard A. Harrison Symposium. Twenty-nine presentations on topics ranging from classical music in video games to the disenchantment of youth in Colombian cinema to a power analysis of Somali piracy in the modern world will be delivered beginning at 1:30 p.m. in various locations in Main Hall. A complete schedule of presentations, times and locations can be found here. The presentations are arranged into panels by topic or field and are moderated by a Lawrence faculty member. Faculty nominate and invite students to submit an abstract of their research. Symposium participants are then selected based on the abstracts and present their work in the format used for professional meetings of humanities and social sciences scholars. Each presentation lasts approximately 20 minutes and is followed by a 10-minute question-and-answer session. Exceptional research conducted by Lawrence University students in the humanities and social sciences will be showcased Saturday, May 14 beginning at 9:15 a.m. in Main Hall during the 14th annual Richard A. Harrison Symposium. Twenty-seven students will deliver presentations on research subjects ranging from black masculinity in contemporary American film, to Yan’an’s influence on the evolution of propaganda music in China to the importance of the potato in Peruvian society. Each presentation will last approximately 20 minutes followed by a 10-minute question-and-answer session. Two sessions of presentations are arranged into panels by topic or field and are moderated by a Lawrence faculty member. Student presenters are nominated by faculty and invited to submit abstracts of their research papers. Based on the abstracts, students are selected to present their work in the format used for professional meetings of scholars in the humanities and social sciences. The symposium honors former Lawrence Dean of the Faculty Richard A. Harrison, who organized the first program in 1996. 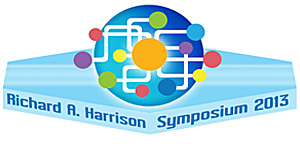 Harrison died unexpectedly the following year and the symposium was renamed after him to recognize his vision of highlighting excellence in student scholarship.